Christie® is pleased to announce that its latest Christie HS Series projectors will be used at the GLOW Eindhoven international light art festival from November 10 to November 17 at Eindhoven city centre. A total of 12 Christie D20WU-HS projectors will be utilised in an impressive video mapping installation on the face of the 19th century Catharinakerk, a neo-gothic Roman Catholic church located in the centre of Eindhoven. The projectors – which are being provided by Christie partner Sahara Benelux – are the lightest and brightest 1DLP® laser phosphor projectors available. Hundreds of thousands of revellers are expected to descend on Eindhoven for the international light art festival, which attracts international artistic talent in the field of light art and technology. 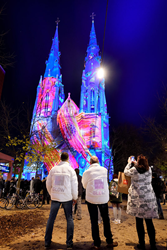 The event, which is in its 13th iteration, will see more than 30 art installations located on a 5km route across Eindhoven’s city centre, with this year’s theme based on ‘Shadows & Light’. At Catharinakerk, visitors will see the Confluence video mapping installation powered by the D20WU-HS projectors, which can operate at full brightness on a single 15A, 110V circuit. The original project – created by Ocubo – is inspired by the confluence of rivers and streams in Holland. The kinetic art will also see virtual dancers guide the viewer through the film, with flourishes of colour emphasising the church’s stunning architecture in an array of eye-catching geometric combinations. Christie partner Sahara Benelux is also providing 10 Christie UHD 551-L LCD panels for Glowie, an interactive art installation combining chatbot technology, voice commands and light art. Christie Digital Systems USA, Inc. is a global visual and audio technologies company and is a wholly-owned subsidiary of Ushio Inc., Japan, (JP:6925). Consistently setting the standards by being the first to market some of the world’s most advanced projectors and complete system displays, Christie is recognized as one of the most innovative visual technology companies in the world. From retail displays to Hollywood, mission critical command centres to classrooms and training simulators, Christie display solutions and projectors capture the attention of audiences around the world with dynamic and stunning images. Visit http://www.christiedigital.com for more information.